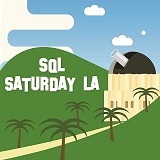 SQL Saturday L.A. is just around the corner! It will be held on June 9th, 2018 at Loyola Marymount University (“LMU”), 1 LMU Drive, Los Angeles, California, Los Angeles, California, 90045. I will be presenting a session on performance tuning jobs. Learn performance tuning strategies on how to cut hours (not minutes) from your jobs. There is still time to register so be sure to signup today! This entry was posted on May 14, 2018 at 4:44 pm	and is filed under Events. You can follow any responses to this entry through the RSS 2.0 feed. You can leave a response, or trackback from your own site.